After months of research, this past winter we finally made up our mind and bought a BCS two-wheel tractor. Though the expression is overused, we will still say that this tool has been a “game changer”. When we talk to people about our new tractor, we often get some raised eyebrows, especially since we’re in corn and soybean country and when we say “tractor” that conjures up images of much bigger vehicles. So, here’s the skinny with our BCS. These Italian-made, two-wheel tractors have been popular in Europe for decades. With the resurgence of small-scale farming in the U.S. the past few years, they are becoming standard fare for little farms like ours. Our BCS looks like a tiller, but it is actually a whole heckuva lot more. The tractor is entirely gear driven, so no belts to break. It’s built as sturdy as a full-size tractor, but in a much smaller package. It has a PTO that allows the user to attach all sorts of implements to the unit. 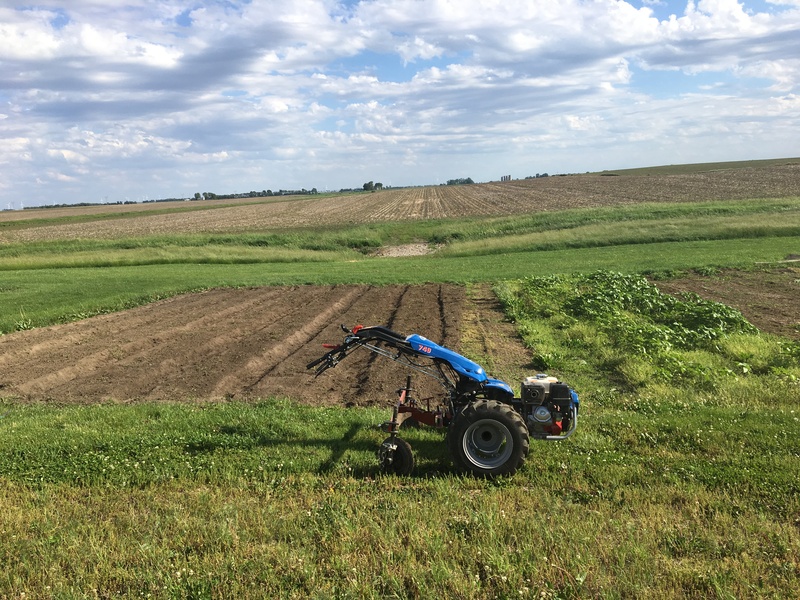 Harrow Plow–This is similar to a rototiller, but instead of inverting the soil layers (thus destroying soil structure and bringing up a new crop of weed seeds) this stirs the soil. It is much gentler on the soil, keeps weed seeds from coming to the surface, and prepares an ideal bed for seeding and germination. Flail Mower–This little mower is a beast. It can chop up brush up to the size of small trees. It is especially useful for us when we are trying to turn over a bed for the next crop. This chops up residue into tiny pieces, and prepares the bed to be tilled with the harrow plow. Before, I would use a pickaxe to, one by one, dig out sunflower stems and roots. It would take me well over an hour to do one of our 50 foot beds, and was absolutely dreadful work. Now the same job takes less than five minutes. Bed Shaper–This tool simply plows the soil into 30” raised beds and creates pathways in between each bed. Before, we would hand dig each bed with a shovel, and then till everything up in the fall so that we can to start all over again. Last year we dug over 50 fifty foot long pathways, and we vowed that we just couldn’t do it again. Though it takes some time to dial this in and figure out how to do it best, this tool makes the job much quicker and much less strenuous on our thirty-something bodies. We have found that using a raised bed system has a few advantages: We rarely have to step on our planting areas, so they don’t get unnecessarily compacted. The beds warm up sooner in the spring, and water drains from them more quickly. We can also only add soil amendments to our planting areas and not waste money and resources on the areas where we just walk. And now that we have BCS implements made for the exact width of our beds, we can have at least semi-permanent raised beds that don’t require us to start over every year. There are more than 30 implements that we can add to our BCS, so as we continue to evaluate our needs, we will most likely add to its usefulness. This tool has been our largest single investment up to this point in our farming adventures, but at this point we’re convinced that we made the right choice. For the home gardener, there are BCS models that are cheaper that suit your needs well. We recommend Earth Tools in Kentucky. They are the largest BCS dealer in the country, and their YouTube videos are about all things BCS and have been absolutely invaluable to our steep learning curve with this machine.